Crooked Granny Grunt Please Drink Your Milk is a children's conceptual picture book written by Rhonda Fischer and illustrated by Adam Allen Berry. Oliver loves his Granny Grunt, but he wishes he could get her to drink her milk. She hated milk when she was small and not drinking it left her small and crooked now that she is old. Her doctor tells her to drink her milk for her bones, but Granny would rather drink soda than milk. Oliver worries about her, and he hates it when he sees her with the soda pop. He thinks maybe he could get a milking cow so she can have fresh milk every day. But until he can do so, he's going to try to make sure she drinks at least this one glass. He's got a plan all figured out. He'll get Granny Grunt to go to bed and then bring her a snack and a glass of milk. Will she drink it? He doesn't know what will happen when he goes into her room, but he's determined to get her to take at least one sip. 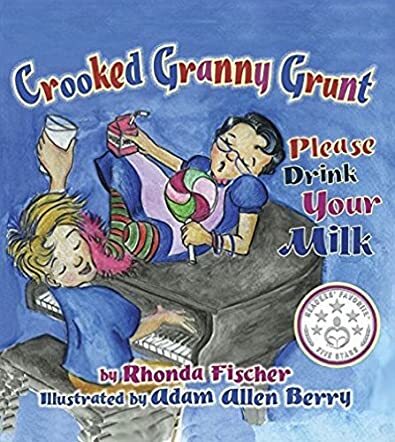 Rhonda Fischer's conceptual picture book for children, Crooked Granny Grunt Please Drink Your Milk, employs a humorous plot and tone to impart an important nutritional message. Lots of kids are reluctant to drink milk and may, like Granny Grunt, much prefer to drink soda. It may not seem to affect their health now, but it will when they are older. Fischer's tale is lyrical and humorous. Oliver's love and concern for his granny are real and tangible, and these two appealing characters make the story come alive. The story is told in rhymes that flow nicely without feeling sing-songish or repetitive. Adam Allen Berry's illustrations are superb. They have a classic feel to them that reminded me of the work of some of the great cartoonists of the mid-twentieth century as Granny skips, flips, and eats her way through the story in a succession of brightly colored and whimsical drawings. Crooked Granny Grunt Please Drink Your Milk entertains as it educates, and it's a fine choice for story time. New readers will find it fun and a bit challenging at times, which is a good thing. Crooked Granny Grunt Please Drink Your Milk is most highly recommended.